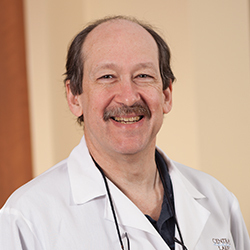 Family Physician Peter MacKay, D.O., has practiced at Cuyuna Regional Medical Center’s Crosby Clinic since 1991. He has special interests in migraine headaches, osteopathic medicine and male sterilization. A Board Certified Family Practitioner, he is a member of the American Board of Family Physicians, National Board of Examiners for Osteopathic Physicians and the American Academy of Family Physicians. Dr. MacKay received his undergraduate degree from the University of Minnesota and earned his Doctor of Osteopathy degree from Kirksville College of Osteopathic Medicine in Kirksville, Mo. He served in the United States Air Force Medical Corp and completed his residency at USAF Medical Center Scott Air Force Base in Illinois. Dr. MacKay and his wife, Debbie, live in Crosby. Outside of his practice, Dr. MacKay enjoys bladesmithing, bacon, the zombie apocalypse and the BLUES!